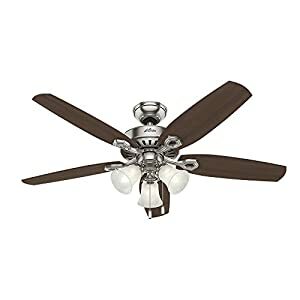 Best Outdoor Ceiling Fan Reviews: Top 10 in April 2019! Getting an outdoor ceiling fan is a great way to improve your home’s exterior aesthetics. Many people are going down this route for many reasons. Not only do you get to update your look but you also get to have constant air circulation. Some people may wonder why one would need a fan outdoors. After all, isn’t the wind enough? But we all know how hot summer days can be, even when outside. As such, these devices not only serve decorative purposes but they are also quite essential. Before I take you through the best outdoor ceiling fans, let’s first cover some basics. 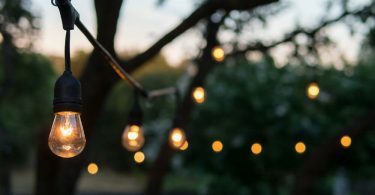 Why do you need an outdoor ceiling fan? Having an outdoor fan enhances the looks of your home. You also get to experience a more relaxed feel when in the outdoors. Summer days can be frustrating, especially when the temperatures are scalding. With a fan, you can keep cool on those hot days and nights. Outdoor ceiling fans are quite helpful. There are factors that you must consider before bagging yourself one. First off, you must think about what kind of a fan it is. Getting an indoor fan for outside use will not work. Given that these fans don’t come cheap, it is essential that you get the right one at the start. One of the differences is the crafting. An outdoor fan gets made in a way that it can withstand weather elements. As such, it is sturdier as compared to an indoor fan. Outdoor fans also come equipped with motor casings and waterproof seals for safety. The blades used in outdoor fans get constructed of long-lasting materials like ABS plastic. Getting an indoor fan made of wooden edges will result in warping and wobbling. That is why people don’t use inside fans on the outside. Summer days can get even better with the use of an outdoor ceiling fan. The cool breeze will have you feeling very relaxed, but only if you get the right fan. Where you reside plays a big part in the choosing of a fan. If you are close to the ocean, you should get a UL-wet rated fan. The salty nature of the ocean breeze affects the durability of outdoor items. A UL-wet rated fan is durable against corrosion and requires little maintenance. 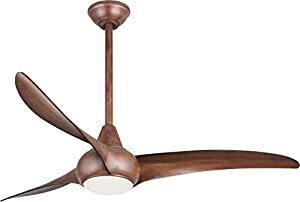 In my guide, you will find amazing wet-rated ceiling fans suitable for you. For those in dry regions, there is little need for a UL-wet rated fan. The size of fan you choose determines how much space can be cooled. 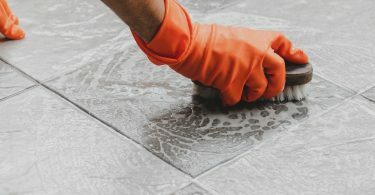 Know what area you are dealing with before making the purchase. For example, a thirty-six-inch fan will serve a room of 144 square feet. As such, make your purchase accordingly. The minimum clearances also affect the size of fan you can get. Installation should be at least twelve inches from the ceiling and 84 inches from the floor. You must also make an allowance of 24 inches from the blade to the wall. These dimensions affect how big your fan can be. Given that fans also serve decorative purposes; get one that suits the style of your porch. For example, a traditional ceiling fan will suit a Victorian style porch. Getting the right fan for your décor is a great way to avoid clashing of styles. Fans in solid colors blend in with the ceiling. If you wish to have something more conversational, go for something bold. When it comes to material, you need something durable. Powder coated metal rusts over time and shouldn’t get used outside. Go for something in stainless steel or aluminum for continued service. With these factors in consideration, you not only get to have a decorative fan but also get to make a sound investment. It’s now time to get to the best outdoor ceiling fans. The fans on my list meet the criteria for outdoor suitability and are cost-friendly. I have covered fans that fall into various categories such as small outdoor ceiling fans and wet-rated ceiling fans. 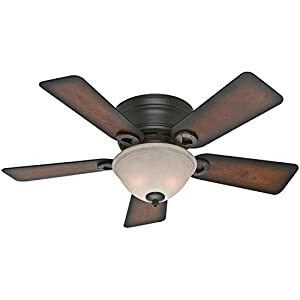 This fantastic fan leads when it comes to cheap outdoor ceiling fans. You get to have value for your money, thanks to its wide array of features. Available in the colors ‘fresh white’, brushed nickel and noble bronze, you are bound to find a hue suitable for your décor. It operates on a WhisperWind motor which delivers powerful air movements. The good thing about its operation is that it is silent and does not interfere with your relaxation. It comes with three variable speeds which you can alter according to your preferences. Able to rotate in thirteen degrees, optimum air movement gets guaranteed at peak levels. 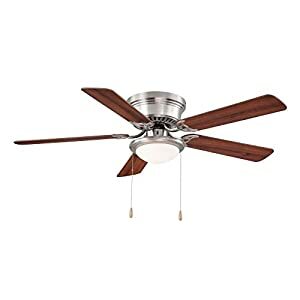 According to Wikipedia, the direction of a blade affects cooling and heating processes ceiling fan. This fan comes equipped with a reversible motor to help in draft direction. Materials used in its manufacture are metal and glass. It weighs twenty-two pounds and is ETL certified. The warranty provided upon purchase lasts a lifetime. This fan is ideal for rooms with low ceilings, and it comes with one hand-held remote control. Included in the package is a light kit with cased white glass. Also included are two LED bulbs which are dimmable. The dimmable nature of the bulbs makes it possible for you to create the perfect ambiance for relaxation. 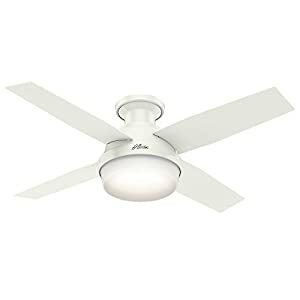 Accessories that go with this ceiling fan include controls, angled ceiling mounts, down rods and light kits. For small outdoor ceiling fans, the Hunter 59135 is the right choice. It comes in a gray pine hue and is equipped with five reversible blades. It has a weathered zinc finish. You can experience both powerful cool currents and silence thanks to the use of a WhisperWind motor. You can mount the fan in various positions thanks to three different mounting systems. Options include low, standard or angled mounting. The blades have a 13-degree pitch. Included in the package is a pull chain for speed adjustment. It operates on 120 power voltage. The blades are reversible to allow you to change the draft direction depending on the season. Downdraft mode works best during summer while the updraft mode is ideal for winters. This fan is suitable for use in damp environments, thanks to the use of waterproof seals. It comes with a lifetime warranty and the materials used in construction are metal, plastic, and glass. This fan is ETL damp rated and can be used in sunrooms and covered porches. You can use it in wet areas without worry of rust. You will need controls, down rods, angled ceiling mounts, and light kits to thoroughly enjoy its features. They are all included in the package. This model works with other accessory controls such as the 99123 and the 99375. Other items in the package include two 14 watts medium bulbs. 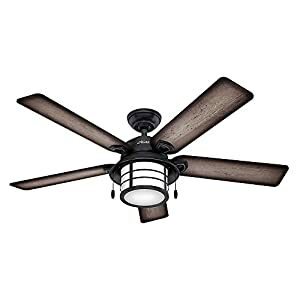 The Hunter 53237 is one of the best wet-rated ceiling fans on the market. Its success is hinged upon the fact that it offers excellent capabilities at a fair price. In addition to this, the installation process is quite easy. Its vast size allows it to cool as much as four hundred square feet. It comes in brushed nickel, snow white, and Brazilian cherry hues. The fan measures fifty-two inches and uses metal and glass in its craft. As is the case with other Hunter fans, it uses a WhisperWind motor. The essence of this motor is that it operates silently while giving off powerful currents. The motion is reversible, which comes in handy when seasons change. You have three mounting options: low, standard and angled. For ease of operation in speed adjustment and power options, it comes with a pull chain. With both upward drafts and downward drafts available, this fan serves your needs throughout the year. It comes with five reversible blades. A limited lifetime warranty gets availed to you upon purchase. The manufacturer has over a century’s experience in the fan industry which is a guarantee of longevity. The blades are coated with dust armor to prevent the buildup of dust. Adequately waterproofed, you can use this fan in the outdoors without running the risk of rust. You will find a 3-light fitter in the package which comes with swirled marble glass. Also included are three 60 W incandescent bulbs. For one of the best-rated ceiling fans on the market, choose the Hampton Bay Hugger 52 In. It comes in a lovely brushed nickel hue and is designed to last a lifetime. It comes with five reversible blades to allow for control of draft direction. The edges have a walnut finish on one side and a maple one on the other. These colors complement most interior decors. The fan uses a multi-capacitor which allows it to operate silently. The air movement provided at high speed is at an optimum level. It uses a flush mount type. Weatherproofed against moisture, this fan can work for decades. Materials used in its making are glass and metal. All you require is a little maintenance to keep things running. The colors work with different interior designs. You can use this fan in damp environments, thanks to the waterproofing. This fan requires the use of a medium-base bulb. The bulb does not come with the package, and you are free to choose one of your preference. Great wet rated wall mounted outdoor fans are hard to come across. Luckily, there is the Minka-Aire F844-DK LightWave which provides utmost relaxation in the exterior. It comes in brown, silver and white. This array of neutral colors works excellent with different interior decors. It comes with a motor with the dimensions of 172mm by 14mm. This motor requires 65.3 Watts during operation. 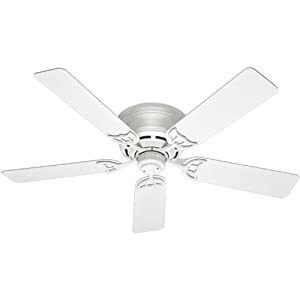 The fan makes use of three blades with a 52-inch span as well as a 48 blade pitch. These blades can generate powerful air movements. It uses a down-rod mounting type. It has UL certification and comes with a lifetime warranty. This fan works well in dry regions, and the colors availed blend in with various decors. You will find a hand-held remote in the package which operates at three speeds. It can dim the lights to your preference. If you wish to reverse the movement, this can be done on the motor manually. A 17 watts LED light is in the package. If you have an ample space to cool, it’s best to go for large outdoor ceiling fans. In this category, no fan works better than the Hunter 53236 Builder. It falls in the range of Hunter products and comes from a manufacturer with expertise in the fan business. This fan, available in a white hue, works with all kinds of exteriors without clashing. As with other Hunter fans, it uses a powerful and silent WhisperWind motor. You will barely hear a thing as it operates, save for the soft swishing of air. The fan motor is reversible to allow you change the movements based on seasons. It comes with three mounting systems: low, standard and angled. The pull chain included helps in speed adjustment and switching on/off. You get to have a lifetime warranty from an expert in the fan business. The five reversible blades are coated with dust armor to prevent dust buildup. This fan is suitable for rooms where the space to be cooled is big. It comes with three 60 watts bulbs to fully illuminate the exterior. 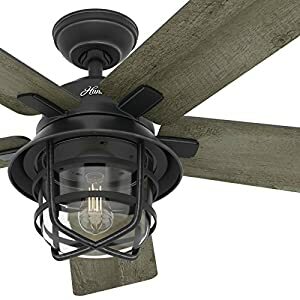 The Hunter Fan 54″ Weathered Zinc Outdoor Ceiling takes the lead when it comes to ceiling fans without lights. If you are looking to have a fresh breeze and have no need for lighting, this fan will work like a gem. It comes in a beautiful weathered zinc finish that will match your décor. It operates on five grey pine blades at a voltage of 110. These blades are reversible to allow for downdrafts and updrafts. The use of stainless steel in its manufacture makes it resistant to rust. An armor coat gets used for the prevention of dust buildup. This fan is damp-rated, allowing you to use it in wet outdoor spaces. Its large size also makes it suitable for use in significant areas. It comes with a hand-held remote control for use in speed control, switching on and blade reversal. 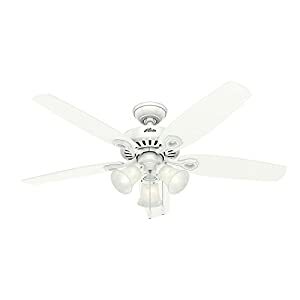 If you are in the market for a large ceiling fan with light, look no further than the 52″ Casa Delta. It comes in white and ivory brown hues and includes an LED light kit in its package. It comes with three blades with a fifty-two-inch span. The edges have a nine-degree pitch, allowing them to move air at fast speeds. The package comes with one six-inch down-rod, and the canopy is six inches wide and 2 inches high. The blades, made of solid wood, have a walnut finish for the brown hue. It comes with a UL listing and is not suitable for use in salty or humid regions. It should not be exposed to damp regions as it will warp. When used in dry climates, the fan can run for decades on end. Included in the package is a hand-held remote for ease of control. When it comes to best ceiling fan brands, it goes without saying that Hunter is a household name. The Hunter 53069 is one such product that has received approval from all over the world for its fantastic capabilities. It comes in both grey and white hues which work with various decors. This fan, equipped with five blades, can serve a space as big as four hundred and eighty-five square feet. The fan blades measure fifty-two inches and have a 13-degree pitch. The air movement provided is powerful and silent. Hunter uses a motor technology to ensure that the motor stays silent even after years of use. The blades are reversible and operate on high, medium and low speeds. With regards to aesthetics, these blades can work with any room. You can use this fan in all kinds of environments. The material used in the making of the blade, metal, is resistant to rust. The fan comes with a lifetime warranty. You need a remote to control the movements and speed of the fan. 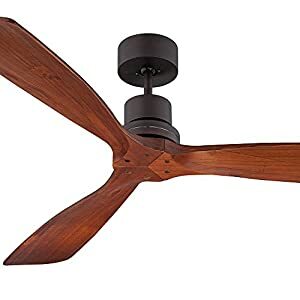 Hunter has some of the highest rated ceiling fans to its name. One such fan is the Hunter Fan Company 51023 Conroy. It works in damp environments and has adequate air movements to serve a small space adequately. With a WhisperWind motor in place, this fan delivers air movements at optimum levels. The design used is ideal for flush-mount installation in spaces with low ceilings. This fan can work in various environments, thanks to the use of metal and glass in its construction. Its beautiful burnished mahogany hue makes it ideal for use in different exteriors. Dust armor is used on the blades to prevent the buildup of dust. A lifetime warranty gets availed to you upon purchase. Two 60 watts candelabra bulbs are in the package. These can be installed without a light kit, which makes the process quite easy. You also get a pull chain in the box. You will notice that I paid close attention to suitability and durability in my reviews. I believe that a fan is a lifetime investment and as such, close attention must get paid to the selection. Once you have a functional, durable fan suited to your size and region, you are all set for grand summers.